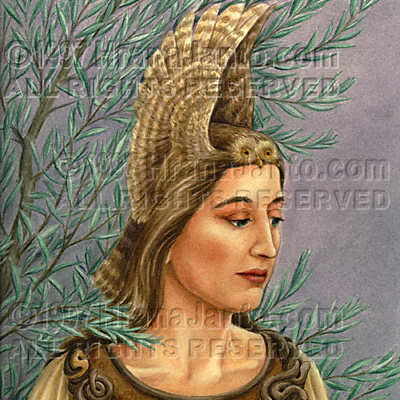 I painted Minerva in 1996 for The Goddess Oracle. It is clear that the goddess' name derives from the ancient root for "mind," and her domain was-even more than Athena's-intellectual. She was wisdom incarnate in female form, the goddess therefore of the application of intellect to everyday work, thus of commerce and crafts. She was also said to be the inventor of music, that most mathematical of arts, as well as the instruments on which it is played. The Romans celebrated her worship from March 19 to 23 during the Quinquatrus, the artisans' holiday which was also a festival of purification. The "goddess of a thousand works," as Ovid called her, was pleased to see scholars and schoolmasters join in spring vacation with those who labored with their hands. Minerva Medica If her name seems Roman, it is only because of the imperial legions' policy of interpretatio Romano whereby Celtic goddesses were assimilated to those from their homeland. Many local and tribal goddesses lost their identities this way; many became Minervas, perhaps because they were originally connected with household industry, war, or healing-all of which fell under the dominion of the Italian original. At least one "Minerva"-Sul of Bath in England- was strong enough to resist renaming; she became Sulis Minerva.